Members of the complex N-methyl-D-aspartate receptor (NMDAR) subfamily of ionotropic glutamate receptors (iGluRs) conventionally assemble from NR1 and NR2 subunits, the composition of which determines receptor properties. Hallmark features of conventional NMDARs include the requirement for a coagonist, voltage-dependent block by Mg2+, and high permeability for Ca2+. Both Mg2+ sensitivity and Ca2+ permeability are critically dependent on the amino acids at the N and N+1 positions of NR1 and NR2. The recently discovered NR3 subunits feature an unprecedented glycine-arginine combination at those critical sites within the pore. Diheteromers assembled from NR1 and NR3 are not blocked by Mg2+ and are not permeable for Ca2+. Employing site-directed mutagenesis of receptor subunits, electrophysiological characterization of mutants in a heterologous expression system, and molecular modeling of the NMDAR pore region, we have investigated the contribution of the unusual NR3 N and N+1 site residues to the unique functional characteristics of receptors containing these subunits. Contrary to previous studies, we provide evidence that both the NR3 N and N+1 site amino acids are critically involved in mediating the unique pore properties. Ca2+ permeability could be rescued by mutating the NR3 N site glycine to the NR1-like asparagine. Voltage-dependent Mg2+ block could be established by providing an Mg2+ coordination site at either the NR3 N or N+1 positions. Conversely, "conventional" receptors assembled from NR1 and NR2 could be made Mg2+ insensitive and Ca2+ impermeable by equipping either subunit with the NR3-like glycine at their N positions, with a stronger contribution of the NR1 subunit. This study sheds light on the structure-function relationship of the least characterized member of the NMDAR subfamily. Contrary to previous reports, we provide evidence for a critical functional involvement of the NR3 N and N+1 site amino acids, and propose them to be the essential determinants for the unique pore properties mediated by this subunit. Excitatory neurotransmission in the vertebrate central nervous system (CNS) is mediated to a large extent by ionotropic glutamate receptors (iGluRs). Signal transmission effected via the subfamily of N-methyl-D-aspartate (NMDA) receptors underlies complex long-term processes and accounts for the establishment of synaptic plasticity. NMDA receptors (NMDARs) conventionally assemble as heterotetramers from NR1 and NR2 subunits, which carry the ligand-binding sites for glycine and glutamate, respectively. A characteristic of conventional NMDARs is their sensitivity to Mg2+ ions. At membrane potentials below -40 mV, the ion channel of these receptors is blocked by extracellular Mg2+ binding within the pore at the so-called N and N+1 positions [1–3]. The N position is located at the narrow constriction of the pore loop; it is the functional equivalent to the Q/R editing site in AMPA receptors. In both rodents and man, NR1 features an asparagine (Asn, N) at this position, followed by serine (Ser, S) [4, 5]. The NR2 subunit has two adjacent asparagines at the N and N+1 positions. Thus, in conventional NMDARs, four Asn residues per pore form a constriction. The importance of this site for coordinating Mg2+ has been recognized early on; experiments with mutant subunits demonstrated that Mg2+ blockage critically depends on the amino acids at the N and N+1 positions [2, 3, 6]. The residues at the N and N+1 positions are also largely - but not exclusively - responsible for the characteristically high Ca2+ permeability of conventional NMDARs [1–3]. With the discovery of the glycine-binding NR3 subunits [7, 8], the question of the contribution of these subunits to NMDAR function arose. Strikingly, the N site of the NR3 subunits is unique in the NMDAR subfamily: In both NR3A and NR3B this position in rodents is occupied by glycine (Gly, G), followed by arginine (Arg, R) [7–9]. Even more exceptional is the human NR3B subunit, which features two adjacent arginines at the N and N+1 positions [9, 10]. These unprecedented combinations of amino acids occupying those critical sites might effect dramatically altered NMDAR properties, particularly concerning Mg2+ block and Ca2+ permeability, when NR3 is present. In line with this, studies of heterologously expressed NMDARs revealed a reduction of Ca2+ permeability in the presence of NR3B [11, 12]. However, a definite influence of NR3 on the Mg2+ sensitivity of conventional NMDARs is controversial: While several studies suggested no influence of NR3 on Mg2+ sensitivity [8, 9], a reduction of Mg2+ block has been shown in heterologous expression systems  and NR3A-transgenic  and NR3A knockout mice . The exact contribution of NR3 to the hallmark properties of NMDARs thus remains a matter awaiting clarification. A powerful tool to investigate the influence of NR3 presented itself with the discovery of excitatory glycine receptors built from NR1 and NR3 subunits in the absence of NR2 . These NR1/NR3 diheteromers are fully activated by glycine alone, insensitive to Mg2+, and not permeable for Ca2+ . Whether they exist in vivo remains controversial, but their formation in heterologous expression systems can be exploited to understand the mechanisms by which the still poorly understood NR3 subunits influence the NMDAR core characteristics of Mg2+ block and Ca2+ permeability. Several studies have targeted the NR3 N site residue as a functional hotspot concerning Mg2+ sensitivity and permeability for Ca2+, using site-directed mutagenesis of the N site amino acid and electrophysiological characterization of mutant subunits to clarify the functional impact of the NR3 N and N+1 site amino acids [7, 8, 12]. None of these studies reported a functional consequence of the NR3 N and N+1 site residues; however, in all cases investigations had been limited to triple expression experiments of NR1/NR2/NR3 receptors. 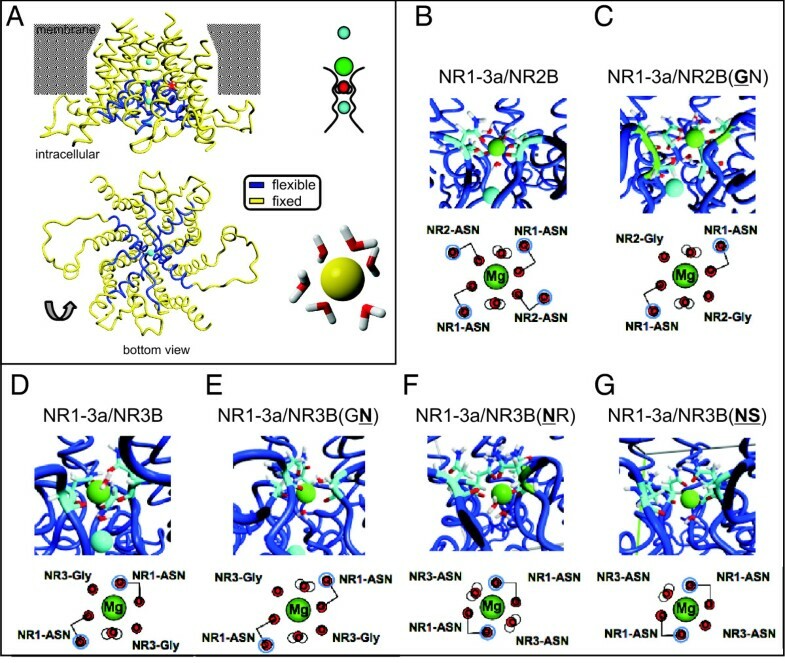 In such an experimental design, the contribution of NR3-containing NMDARs might be masked by the additional assembly of conventional NR1/NR2 receptors. We have taken advantage of the fact that NR1 and NR3 assemble into diheteromers. To shed light on the mechanisms by which NR3 governs the unique properties of NR1/NR3 receptors, we have performed site-directed mutagenesis of NR1, NR2 and NR3 N and N+1 site residues. Mutant subunits were heterologously expressed in Xenopus oocytes and electrophysiologically characterized. Contrary to previous studies, we report a significant influence of the NR3 N and N+1 site amino acids on the ion channel properties, and suggest a mechanism by which NR3 may affect Mg2+ sensitivity of NMDARs. The following clones were used: NR1-3a (GenBank: U08265), NR2A (GenBank: NM_012573), NR2B (GenBank: U11419), and NR3B (GenBank: NM_130455). For expression in oocytes, all wild types and mutants were inserted into the vector pSGEM, a modified version of pGEMHE . All N and N+1 site mutants were generated via PCR-directed mutagenesis using specific mismatch primers (microsynth.ch, Switzerland). cRNA was synthesized from 1 μg of linearized DNA using an in vitro transcription kit (mMESSAGE mMACHINE™ Kit, Ambion) with an extended reaction time of 2 h with T7 polymerase. Oocytes of Xenopus laevis frogs (Nasco, Fort Atkinson, WI) were surgically removed from the ovaries and defolliculated as described previously . Oocytes of stages V-VI were selected and maintained in Barth's solution supplemented with 100 μg/ml gentamicin, 40 μg/ml streptomycin, and 63 μg/ml penicillin. Injection of cRNA was performed using a nanoliter injector (World Precision Instruments, Sarasota, FL). 6 pmol of cRNA were injected for each receptor subunit (NR1 to NR3 ratio: 1:1; NR1 to NR2 ratio: 1:1; both cRNAs were mixed before injection in a standard volume). Four to six days after injection, oocyte current responses were recorded under voltage clamp at -70 mV holding potential with a TurboTec 10CX amplifier (npi Electronic, Tamm, Germany) controlled by Pulse software (HEKA Elektronik, Lambrecht, Germany). Recording pipettes were pulled from borosilicate glass (Hilgenberg, Malsfeld, Germany). Voltage electrodes had resistances of 0.5-1 MΩ and were filled with 3 M KCl; current electrodes had resistances of 0.5-1 MΩ and were filled with 3 M CsCl. Agonists (100 μM glutamate, 10 μM glycine) and antagonists (0.5 mM Mg2+) were prepared in normal frog Ringer's solution (NFR) (115 mM NaCl, 2.5 mM KCl, 1.8 mM CaCl2, and 10 mM HEPES-NaOH, pH 7.2) for the determination of current responses and Mg2+ block and were applied for 20 s by superfusion at a flow rate of 5 ml/min. Current-voltage relationships were determined by ramping holding potentials between -150 mV and +50 mV within 2 s in the presence of agonist and correcting them for background conductivities by subtracting the average of two control current-voltage relationships measured before and after agonist application. To limit a possible influence of Ca2+-activated Cl- channels, oocytes were injected with 50 nl of 200 mM EGTA-NaOH, pH 8.0, 15 min prior to recordings of Mg2+ sensitivities. For better comparison between different combinations, current-voltage relationships from 3-4 experiments were independently normalized to +20 mV and averaged. with [Mono+]i = concentration of intracellular monovalent cations [mM], [Ca2+]o = concentration of extracellular calcium cations [mM], Erev = reversal potential [mV], F = Faraday constant [9.65 104 Cmol-1], R = gas constant [8.314 Jg-1K-1], T = temperature [K]. To determine the concentration of intracellular cations [Mono+]i, oocytes expressing the GluR6(Q) receptor with a known PCa2+/Pmono  were measured for each batch. Measurements of GluR6(Q) required pre-treatment of oocytes with concanavalin A for 8 min prior to recordings to inhibit desensitization. All reversal potentials were corrected for the junction potential of -4.5 mV. For all combinations containing NR2, solutions were used at pH 7.2 as described above. All combinations featuring NR3 were measured at pH 8.0 to limit NR3-induced proton inhibition of current responses . Data presented here are reported as mean ± SEM. Statistical significance was determined with an unpaired Student's t test. NR1-3a and NR3B homology models were created based on the KcsA structure (1k4c) Several individual modeling steps using YASARA Structure (version 9.10.5) were required . The consensus homology models are based on the amino acid sequence and refinement of a high-resolution model using a CASP approved protocol . The PDB-data base was searched for known structures with a similar sequence using PSI-BLAST  to identify potential modeling templates. In the case of NR1-3a and NR3B several fold recognition servers and knowledge-based manipulations (see below) had to be consulted and incorporated as well. The templates were ranked based on the alignment score and the structural quality according to WHAT_CHECK  obtained from the PDBFinder2 database . Models were built for the top scoring templates. For each available template KcsA the alignment with the target sequence was iteratively optimized using the evolutionary information contained in related sequences (SwissProt and TrEMBL), the structural information contained in the template and the predicted target secondary structure  to obtain a structure-based alignment correction (partly based on SSALN scoring matrices) . An indexed version of the PDB was used to determine the optimal loop anchor points and collect possible loop conformations if insertions and deletions and dead-end elimination was used to find an initial rotamer solution in the context of a simple repulsive energy function . The loops were optimized by trying hundreds of different conformations, re-optimizing the side-chains for all of them. Fine-tuning of side-chain rotamers was performed considering electrostatic and knowledge-based packing interactions as well as solvation effects. An unrestrained high-resolution refinement with explicit solvent molecules was run using the AMBER03 force field and the result was validated to ensure that the refinement did not move the model in the wrong direction. A final hybrid model was built; bad regions in the top-scoring model were iteratively replaced with corresponding fragments from the other models. The transmembrane domain TM3 was modeled as an α-helix and docked to the outer face of the consensus homology pore module and 1 ns MD simulations were performed on the NR1-3a and NR3B homology model including transmembrane domain TM3 using YASARA with force field YASARA2 in default settings. This force field is very well suited for protein structure calculations in an H2O-filled box . For all further calculations the AMBER03 force field was used with boundary periodic long-range Coulomb cutoff 7.86 Å . The AMBER03 force field is an optimized for point-charge force field for molecular mechanics simulations of proteins . The simulation cell was set at least 5Å around the atoms of the protein. Only, the pore helices and the selectivity filters were kept flexible, whereas the rest of the models were kept fixed. The fixed protein regions provided a surrounding for the flexible pore helices/selectivity filters. The outermost potassium ion in the selectivity filter of KcsA (S1) was substituted by an Mg2+ ion. The parameters of the Mg2+ ion were derived from the AMBER03 force field. The second potassium ion (S2) was replaced by a water molecule. The potassium ions in the outer pore region (S0) and in the lower selectivity filter (S3, S4) were replaced by sodium ions. The simulation box was filled with water at a density of 1.0 g/cm3 (WaterDensity 1.0). The time step was set to 1.0 fs. Intermolecular forces were calculated every 2 simulation substeps. The simulations were performed for about 1 ns. The coordination of the Mg2+ ion was performed using the AMBER03 force field. The Mg2+ ion was placed into the center of a water-filled box. The minimal distance between the Mg2+ ion and the box walls distance was at least 6 Å. The simulations were performed for 1 nsec. The Mg2+ ion stably coordinated six H2O molecules. To examine the contribution of the N site to the unique properties of NR3-containing receptors, the amino acids at the N site and the adjacent position in the NR3B subunit were substituted for NR1-typical residues via site-directed mutagenesis. Conversely, NR1 and NR2 subunits were equipped with NR3-typical glycine residues at their N positions, to test if they, consequentially, might behave like NR3. All N site mutants were transcribed into cRNA, expressed in various combinations in Xenopus laevis oocytes, and examined electrophysiologically for hallmark NMDAR characteristics: agonist sensitivity, Mg2+ block, and Ca2+ permeability. A simplified nomenclature for mutant subunits is employed: Residues at the N and N+1 site are named explicitly after the subunit's name. Thus, NR3B(NS) refers to an NR3B subunit with an asparagine at the N position, followed by serine. In generating mutant subunits, special emphasis was placed on NR3, and a number of mutants were generated for this subunit: Firstly, as has been done previously [7, 8], the N site glycine was mutated to the NMDAR-like residue asparagine (NR3B(NR)). As the N+1 position is occupied by arginine in NR3, and arginine at the N site equivalent of AMPARs is responsible for the very low Ca2+ permeability of receptors including such a subunit, the NR3 N+1 arginine was mutated to asparagine (NR3B(GN)). To give the NR3 subunit a fully NR1-like N and N+1 site, the double mutant NR3B(NS) was generated. Countermutants of NR1 and NR2B were equipped with the NR3-like glycine at their N position (NR1-3a(GS), NR2B(GN)). The exchange of a critical amino acid in the pore region might interfere with channel integrity and thus the subunit's function. Previous studies on NR1 and NR2 N site mutants reported an exchange to be possible without a loss of function [3, 6], and several studies described the successful mutation of the NR3 N site [7, 8, 16]. In a first line of experiments, the general function of the mutated subunits was tested to see if those results could be corroborated. As shown in Figure 1A (left diagram), mutation of the N site of either NR1 or NR2 to glycine did not interfere with the general ability of the subunit to assemble functionally: Both NR1-3a(GS)/NR2B and NR1-3a/NR2B(GN) receptors gave robust current responses after the application of glycine (left axis), but required additional glutamate for maximal activation (right axis). Coexpressed NR1-3a(GS)/NR2B(GN) subunits also assembled into functional receptors, with mean glutamate/glycine-induced current responses of 13076 ± 803 nA. 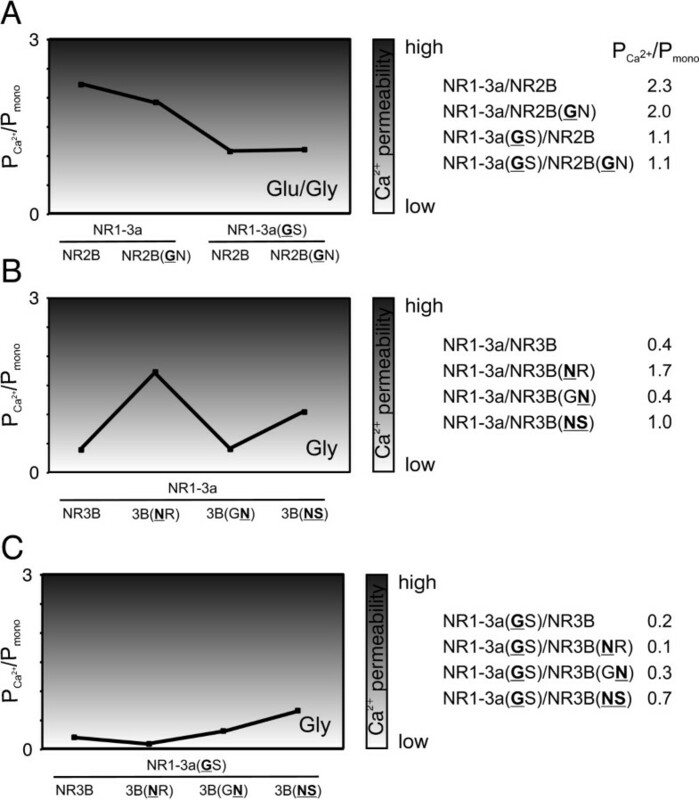 The ratio of glycine- to glutamate/glycine-induced responses ranged between 0.06 ± 0.01 for the wild type combination of NR1-3a/NR2B and 0.15 ± 0.03 for NR1-3a/NR2B(GN) receptors (Figure 1A, right diagram). Agonist-induced current responses of coexpressed mutant NMDAR subunits. Mean current responses elicited by application of glycine alone (Gly, 10 μM) or together with 100μM glutamate (Glu) for NR1/NR2 and NR1/NR3 diheteromers assembled from wild type or mutant subunits. White bars represent mean amplitudes after the application of glycine, black bars denote mean responses after the coapplication of glutamate/glycine; all current amplitudes are shown in nA. The right diagram depicts the ratio of glycine- to glutamate/glycine-induced current responses for each combination. Data shown here are mean values ± SEM, n = 11-48 for NR1/NR2 combinations, n = 5-45 for NR1/NR3 diheteromers; *p < 0.05; **p < 0.01; ***p < 0.005 (Student's t-test). A different agonist profile was recorded when NR3 was present instead of NR2: Again, all combinations tested were functional, but were fully activated by glycine alone, as is the case for wild type NR1/NR3 diheteromers. Mean amplitudes are summarized in graphical form in Figure 1B. As shown, function and a wild-typical agonist profile were seen regardless of whether the NR3 N site, or N+1 position, or both, were exchanged for NR1-like asparagine residues. The same was true when the NR1 subunit was equipped with the NR3-like glycine at its N position (Figure 1C). For all NR3-containing diheteromers, the ratio of glycine- to glutamate/glycine-induced currents ranged between 0.7 ± 0.05 (for NR1-3a/NR3B(GN) diheteromers) and 1.1 ± 0.3 (for NR1-3a(GS)/NR3B receptors), indicating that receptors were fully activated by glycine alone. It is noteworthy, though, that current amplitudes differed between wild type diheteromers and receptors containing mutants: Especially receptors containing a mutated NR2 subunit mediated larger current responses than wild type diheteromers. All current amplitudes shown in Figure 1 are summarized in Table 1. Overview of all current amplitudes and Mg2+ blocks as shown in Figs. 1 and 4. 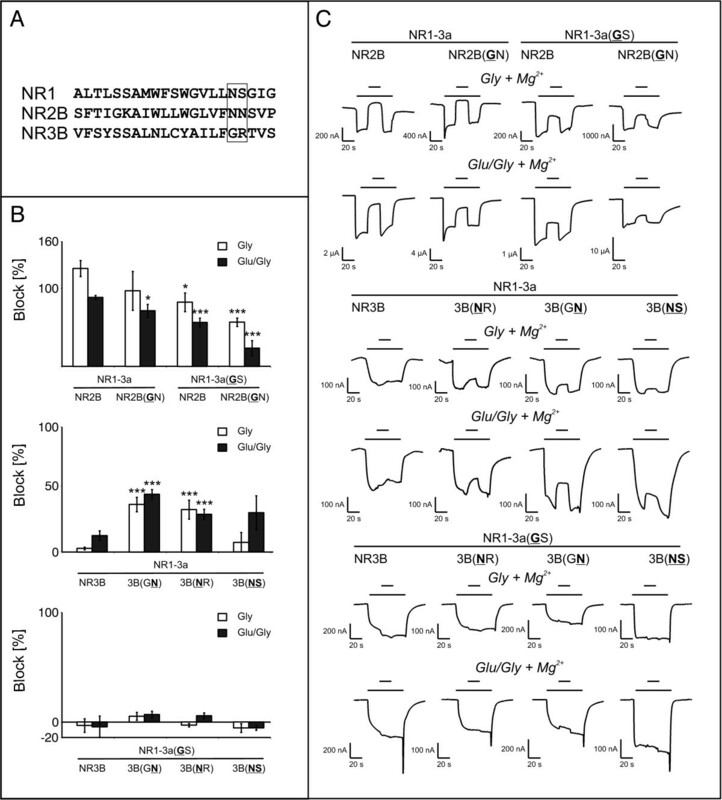 Current responses are mediated by diheteromers featuring N and N+1 site mutant NMDAR subunits measured upon activation by either glycine alone (Gly, 10 μM) or by Gly in addition to glutamate (Glu, 100 μM). Values for current responses are given in nA ± SEM (standard error of the mean). The Mg2+ block is given as % of blocked steady-state current ± SEM. n = number of cells. As function and a wild type-consistent agonist profile were established for all mutated subunits, additional measurements concerning the NMDAR hallmark properties of Mg2+ block and Ca2+ permeability were performed. The receptors' permeability for Ca2+ ions is a characteristic chiefly dependent on the Q/R/N site residues of the constituent subunits. To test whether this also holds true for NR3-containing diheteromers, the ratio of Ca2+ to monovalent cation permeability was determined. A key difference to be considered for NR1/NR2 and NR1/NR3 receptors is the agonist by which the diheteromer is activated. For the conventional NR1/NR2 combinations, it is mandatory to focus on glutamate/glycine-induced currents, as both agonists are required for full activation and govern the receptor's behavior in vivo. For NR1/NR3 diheteromers, it is necessary to consider solely glycine-evoked responses as a) NR1/NR3 form excitatory glycine receptors [15, 21] and b) to minimize possible effects of XenNR2B endogenous to the oocyte [, and compare ]. However, for all subunit combinations both glycine- and glutamate/glycine-induced responses were measured, and all reversal potentials and PCa2+/Pmono values are summarized in Table 2. Overview of reversal potentials (Erevs) and calculated PCa2+/Pmono ratios of diheteromers featuring N and N+1 site mutant NMDAR subunits measured upon activation by either glycine alone (Gly, 10 μM) or Gly in addition to glutamate (Glu, 100 μM). Reversal potentials were measured in 8 mM Ca2+ Ringer. Errors represent the standard error of the mean (SEM). n = number of cells. For the conventional NR1/NR2 receptor, Ca2+ permeability measurements after the application of glutamate/glycine gave a PCa2+/Pmono value of 2.3 for NR2B-containing receptors. For this conventional diheteromer, mutation of the NR1 N site to glycine approximately halved the relative Ca2+ permeability to 1.1 for NR1-3a(GS)/NR2B. On the other hand, mutation of the NR2 subunit's N site residue to glycine had almost no effect in NR2B(GN)-containing receptors (PCa2+/Pmono = 2.0). For the combination of both mutated NR1 and NR2 subunits, PCa2+/Pmono values did not differ much from those obtained when only the NR1 subunit was mutated (PCa2+/Pmono = 1.1 for NR1-3a(GS)/NR2B(GN)). Figure 2A illustrates this: Ca2+ permeability is lowered if an NR3-like NR1-3a(GS) is present in the complex. Ca 2+ permeability of coexpressed mutant NMDAR subunits. Overview of the Ca2+ permeabilities of diheteromers featuring N and N+1 site mutant NMDAR subunits. To the right, PCa2+/Pmono ratios for the investigated combinations are given; the graphs represent those values on a relative scale. For NR1/NR2 combinations, measurements of Ca2+ permeability were performed after the application of 100 μM glutamate (Glu) and 10 μM glycine (Gly). NR1/NR3 diheteromers were activated by glycine alone. n = 5-9. NR1/NR3 receptors behaved differently. Figure 2B depicts the changes in Ca2+ permeabilities for NR1/NR3 receptors with mutations in one or both subunits' N or N+1 site residues. It should be noted that for glycine-induced currents, the wild type NR1/NR3 diheteromer is not Ca2+-permeable, with a PCa2+/Pmono value of 0.4. Mutating the NR3B N site residue to asparagine increased the relative Ca2+ permeability to 1.7, a value almost in the range of wild type NR1/NR2 receptors. On the other hand, replacing the NR3B N+1 residue by asparagine had no effect on Ca2+ permeability upon glycine activation (PCa2+/Pmono = 0.4). If the receptor was activated by glutamate/glycine, Ca2+ permeability was increased to PCa2+/Pmono = 1.7 (Table 2). However, in this case the potential influence of oocyte-endogenous XenNR2B has to be taken into account. This endogenous subunit is capable of assembly with (exogenous) NR1, binds glutamate, and confers Mg2+ sensitivity and Ca2+ permeability to the resulting NR1/XenNR2B receptor . Such a subunit thus has the potential to distort results when measuring NR1/NR3 receptors in Xenopus oocytes , and needs to be taken into account when interpreting results obtained after application of glutamate. For a receptor composed of both mutated subunits, Ca2+ permeability is also slightly increased to PCa2+/Pmono = 1.0. When the NR1 subunit carried a glycine at its N site, receptors were hardly Ca2+ permeable, regardless of the NR3 subunit present (Figure 2C), with PCa2+/Pmono ranging from 0.1 to 0.7. Only for the double mutant combination of NR1-3a(GS)/NR3B(NS) a slightly increased PCa2+/Pmono ratio of 0.7 was recorded. However, if the NR1 subunit was also mutated, Ca2+ permeability was never "rescued" to the same extent as when the mutation was only introduced in the NR3 subunit. The asparagines at the NR1 and NR2 N and N+1 sites have been demonstrated to be essential for Mg2+ block of the receptor. Even though NR3 features a glycine and an arginine residue at the critical positions, it has been argued that these amino acids are not directly responsible for the lack of Mg2+ sensitivity [7, 8, 16, 32]. As those studies have exclusively investigated triple expression of NMDAR subunits, or diheteromers featuring the NR3A subunit, we examined the effect of the NR3B N and N+1 site amino acids in diheteromeric receptors. The Mg2+ block of either glycine- and glutamate/glycine-induced currents for all previously mentioned combinations was tested; values are summarized in Table 1. Shown in Figure 3 are representative current-voltage curves of the conventional NMDAR composed of NR1-3a/NR2B, and of NR1-3a/NR3B diheteromers, with either one or both subunits mutated to feature an NR3-like glycine at their N sites. Mg 2+ block of coexpressed mutant NMDAR subunits: IV relations. 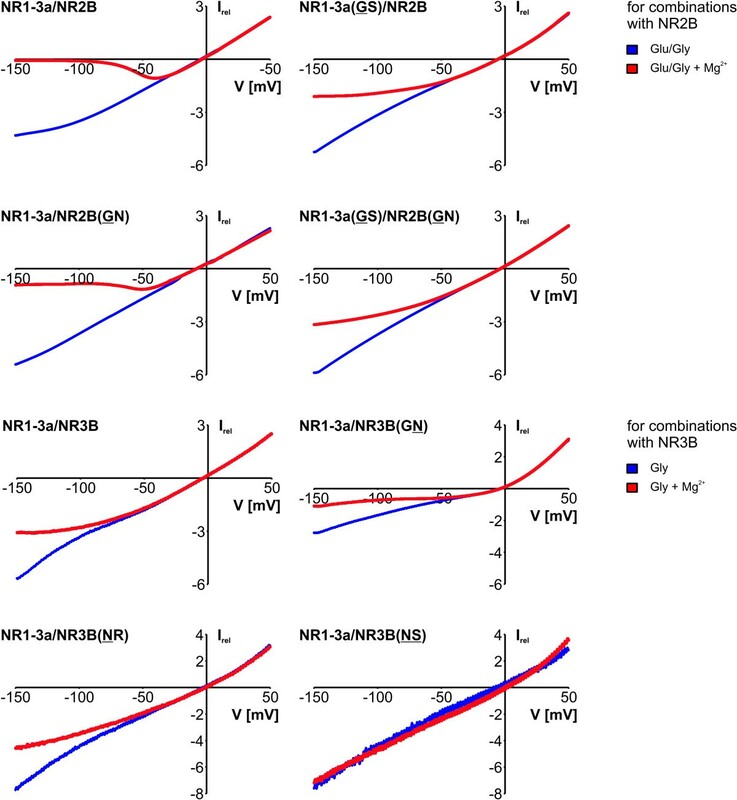 IV relationships of the Mg2+ block of N and N+1 site mutant NMDAR diheteromers. Shown are measurements between -150 mV and +50 mV after application of 10 μM glycine (Gly) alone or in coapplication with 100 μM glutamate (Glu) in the absence (blue traces) and presence (red bars) of Mg2+. Traces represent averages from 3-4 experiments per subunit combination (normalized to +20 mV). If either subunit of the conventional NR1/NR2 receptor was equipped with this N site glycine, the full block by Mg2+ was disrupted. Block of receptor currents still occurred in a voltage-dependent fashion below -50 mV, but in both cases only 70-80% of the glutamate/glycine-induced current response could be inhibited (Figure 4B, upper diagram). If both subunits featured a glycine at their N sites, only 25 ± 8.6% of the glutamate/glycine-induced responses were blocked by extracellular Mg2+. Figure 4C shows representative current responses of the aforementioned mutant receptors. Mg 2+ block of coexpressed mutant NMDAR subunits: mean values and current traces. A. Amino acid sequence of the pore loop regions of rodent NR1, NR2B, and NR3B. The native amino acids at the N and N+1 positions are boxed. B. Mean values (± SEM) of the Mg2+ block of N and N+1 site mutant NMDAR diheteromers. 0.5 mM Mg2+ was applied after activation of the receptor with 10 μM glycine (Gly) alone or in coapplication with 100 μM glutamate (Glu). Statistical significance was determined relative to the respective wild type combination. n = 5-27, *p < 0.05; **p < 0.01; ***p < 0.005. C. Representative current traces of the Mg2+ block of diheteromers featuring N and N+1 site mutant subunits. Agonists (conc. as in B) were applied for 60 s (long bar); Mg2+ was added for 20 s during the application (denoted by the short bar). Figure 5A shows the conformation of the pore region of an NR1/NR3 diheteromer derived from a series of ns-scale molecular dynamics (MD) simulations. A similar conformation is employed by NR1/NR2 receptors. The N site residues are located at the tip of the pore loop, forming the narrow constriction. The Mg2+ ion (green ball) is coordinated at this position, while the N+1 site amino acid is located in the pore helix (red star), contributing to the shape of the selectivity filter. Also shown in Figure 5A is a schematic representation of the ion permeation pathway of NMDARs. Coordination of Mg2+ (green) by the N site residues is stabilized by a Na+ ion (blue) inside the pore, with a water molecule (red) serving as a stabilizing spacer between the two. Above the pore region in the outer vestibule another sodium ion is localized. From this simulation it is plausible that the N site amino acid is directly involved in Mg2+ coordination - and thus a key component for the Mg2+ block. The N+1 site residue, located further behind the narrow constriction in the pore helix, shapes the selectivity filter, but cannot be solely responsible for ion coordination. Additionally, water is required for the coordination of Mg2+ ions. Simulations were performed in a water-filled box, keeping the outer TMD regions rigid and allowing flexibility for the pore helices and the selectivity filter. Consistent with this, in the absence of water molecules (in vacuo simulations), stable coordination of Mg2+ cannot be achieved. In order to get an idea how stable Mg2+ coordination can be obtained, we studied Mg2+ coordination in a water-filled box in an MD simulation. Mg2+ is coordinated by 6 H2O molecules forming an octaeder-shaped water shell. An octahedron-shaped coordination pattern for Mg2+ ions is also seen in Mg2+ and ATP/GTP binding proteins and suggests a favored and stable conformation (Figure 5A, lower right). NMDAR residues may contribute Mg2+-coordinating site components via their backbone carboxygens or by their side chain oxygens. In our simulations, there was always an octahedron-like Mg2+ coordination pattern observed (Figure 5B-G). However, water molecules contribute to different degrees to the Mg2+ coordination as well (Figure 5B-G). Coordination of Mg 2+ within the pore of wild type and N and N+1 site mutant NMDARs. Conformation of the pore region of an NR1/NR3 diheteromer. A. Side view of the selectivity filter of an NR1/NR3 diheteromer. Note that not the entire transmembrane region is shown. A similar conformation is employed by NR1/NR2 receptors. The N site is located at the tip of the pore loop; the N+1 site is located adjacent to that in the helix (marked by the red asterisk). Below, the same diheteromer is shown in a bottom view. The extensive protein loops belong to the NR1 subunits. To the right, a schematic representation of the selectivity filter of NMDARs is depicted: One Na+ ion (blue ball) and one Mg2+ ion (green ball) are coordinated in the pore with a water molecule (red) serving as a spacer. Bottom right: coordination of six water molecules by an Mg2+ ion. B.-G. Coordination of Mg2+ in NMDAR diheteromers. Mg2+ is depicted as a green ball; the blue ball represents Na+. Below each structure is a schematic view of the coordination by water (red with white protons), side chain oxygens (red dots) and backbone oxygens (red dots with blue rings). Figure 5B details the coordination of an Mg2+ ion in a conventional wild type NR1/NR2 receptor: Four backbone oxygens (red balls) coordinate the ion in the presence of two water molecules. The oxygens contributed by the asparagine side chains (in blue rings) stabilize this conformation. If the NR2 N site asparagine is replaced by glycine, coordination of Mg2+ via backbone oxygens is still possible, but the conformation lacks two stabilizing asparagine oxygens (Figure 5C). In NR1/NR3 diheteromers the opposite effect was seen: While the wild type is not blocked by Mg2+ ions, the exchange of either NR3's N site glycine or its N+1 site arginine to asparagine rendered the diheteromer Mg2+-sensitive. However, this effect was more pronounced if the N+1 site arginine was exchanged. Representative current-voltage relationships are shown in Figure 4C. Figure 5D shows the state of a wild type NR1/NR3 pore after an MD simulation. To supply six coordination sites for one Mg2+ ion, one NR1 asparagine residue oxygen would have to substitute for a water molecule. This conformation, which exerts constraints on the pore structure, might be rather unstable, explaining why NR1/NR3 receptors are not blocked by Mg2+ ions. Furthermore, most of the transmembrane domains flanking the pore helices are locked in an artificial, rigid state in the MD simulations. In a fully flexible receptor in vivo, such an asymmetric conformation of the pore might not be supported. Mutating the NR3 N+1 arginine to asparagine results in the same amino acid combination of glycine-asparagine as in mutant NR2 subunits, where the N site asparagine is mutated to glycine. When coexpressed with NR1, both mutants assemble into receptors that are slightly blockable by Mg2+. When comparing Figure 5E to Figure 5C, it is striking how similar the mode of Mg2+ coordination is in those two receptors that are very different except for their N and N+1 site amino acids. This accordance in Mg2+ coordination, solely dependent on the N and N+1 site residues, supports the similarity of those receptors regarding the Mg2+ block. Mutating the N site glycine of NR3 to asparagine leads to the formation of NR1/NR3 receptors that are blockable by Mg2+ to a similar extent as when the N+1 site residue of NR3 is mutated - the mechanism might be rather different, though. As Figure 5F shows, Mg2+ is tightly coordinated in an NR1/NR3B(NR) diheteromer. However, the stabilizing sodium ion within the permeation pathway is not supported by such a conformation, and leaves the pore. The position of this Na+ ion is critically dependent on the N+1 residue. Its leaving the pore might cause a destabilizing effect counteracting the tight Mg2+ coordination, and resulting in a net effect not unlike that of NR1/NR3B(GN) diheteromers. If both the N site glycine and the N+1 site arginine were exchanged for NR1-typical asparagine and serine residues, no block could be detected upon application of extracellular Mg2+. The middle diagram in Figure 4B summarizes the mean values measured for the individual combinations, representative current traces are depicted in Figure 4C. As Figure 5G shows, the lack of Mg2+ sensitivity is likely not due to the failure to coordinate Mg2+. In fact, comparing the MD simulations of the pore regions of NR1/NR3B(NR) and NR1/NR3B(NS) receptors (Figure 5F and 5G, respectively), the coordination of the Mg2+ ion in principle appears very similar between the two. There is a notable difference, though: In the NR1/NR3B(NR) diheteromer, both NR1 N site asparagines supply two oxygens (one from the backbone and one from the side chain, blue encircled) for coordination of Mg2+. The other coordination sites might be occupied by water molecules. In contrast, the Mg2+ ion in the NR1/NR3B(NS) pore is - according to the MD simulation - asymmetrically coordinated, with only one NR3 asparagine involved. Whether a fully flexible receptor in its native environment would support an asymmetrical arrangement of its pore is questionable. The only other subunit for which an MD simulation predicts a pore conformation that does not have a two- or fourfold rotational symmetry is the NR1/NR3B wild type diheteromer - which is not coordinating Mg2+ under natural conditions. residues, those mutants were coexpressed with an NR1 subunit equipped with the NR3-like glycine at the N position. As shown in the lower diagram of Figure 4B, none of the receptor compositions featuring NR1-3a(GS) were blockable by Mg2+. In fact, if the NR1-3a(GS) mutant was coexpressed with either the wild type NR3B or the double mutant NR3B(NS), currents appeared to be potentiated (if feebly) by the addition of Mg2+ ions. However, mean values for NR1-3a(GS)-containing receptors were not different from the NR1/NR3B wild type receptors in a statistically significant way. Representative current traces are depicted in Figure 4C. It is noteworthy that for receptors featuring the mutant NR1-3a(GS) subunit, current traces showed a distinct off-peak (Figure 4C). A similar rebound effect has been described by Madry and colleagues , who could show this effect to be due to the release of the NR1/NR3 receptor from NR1-mediated desensitization. A similar effect might be caused or enhanced by using the mutant NR1-3a(GS) subunit in combination with NR3B. The influence of the amino acids at the pore's narrow constriction - the so-called N and N+1 sites - on hallmark NMDAR characteristics has been recognized early on. Since shortly after the cloning of the NR1 subunit , the groundbreaking work on the importance of the NMDAR N site has been conducted using a combination of site-directed mutagenesis, heterologous expression, and electrophysiological characterization of the mutants. NMDARs featuring NR1 subunits with AMPAR-typical glutamine or arginine residues at their N sites showed a marked reduction of block by extracellular Mg2+. Likewise, Ca2+ permeability was reported to be reduced . Similarly, Wollmuth and colleagues could show that exchanging either the NR1 or the NR2 N site residue to glutamine effectively increases the diameter of the pore's narrow constriction . The increased pore diameter led to a decrease in Ca2+ permeability  - a finding suggestive for NR3B, which natively carries glycine at its N position. Prompted by these findings, the NR3 subunits' unique N and N+1 site amino acid combination has been examined with regard to functional impact almost immediately after the discovery of this "NMDAR-like"  subunit. While Ciabarra and colleagues investigated an NR3A with an AMPAR-typical glutamine in lieu of the native N+1 site arginine , Sucher and colleagues generated an NR3A featuring asparagine at the N+1 position . In a triple coexpression with NR1 and NR2, no influence of the mutated NR3A(GN) on Mg2+ block could be determined , nor did the NR3A(GQ) subunit form functional homomers . Yamakura and colleagues investigated the newly-found NR3B subunit shortly after its discovery, and equipped it with the two adjacent asparagines found at the N and N+1 sites of NR2, but reported no influence of the mutant NR3 on the block of NMDARs by Mg2+ or APV . In this context it is noteworthy that a recent study of fluorescence-labeled NMDAR subunits failed to show triheteromeric assembly of NR1, NR2, and NR3 subunits in Xenopus oocytes . Instead, Ulbrich and Isacoff postulate the existence of separate NR1/NR2 and NR1/NR3 receptor populations in the oocyte membrane . In this case, effects of NR3 might have been masked by the presence of conventional NR1/NR2 receptors in previous studies. We therefore consider it a valid question whether the NR3 N and N+1 site residues are really not at the core of reduced Mg2+ block and Ca2+ permeability in NR3-containing receptors. The success of previous studies to investigate functional N and N+1 site mutants prompted the construction of a new set of point mutants for investigation in diheteromeric expression. However, some deviations from the mutants described previously were incorporated in the design: The NMDAR-typical asparagine was introduced in place of the native NR3 N site glycine. However, in wild type NR3B, the small N site glycine residue might not contribute much as a structural determinant. It is conceivable that the much larger arginine at the NR3 N+1 site protrudes into what constitutes NR3's contribution to the N site, and is really at the core of the low Ca2+ permeability. An arginine at the N position is reminiscent of the GluR2 subunit, where editing glutamine to arginine at this site virtually abolishes the subunit's Ca2+ permeability. Therefore, the NR3 N+1 site was mutated to asparagine independently, producing an NR3B mutant equivalent to the NR3A(GN) examined by Sucher and colleagues . To examine a full N and N+1 site mutant NR3, the approach by Yamakura and colleagues to use adjacent asparagines was not followed . As NR3 is much more closely related to NR1 than to NR2, considering their amino acid sequence (and thus, ligand binding capability), the NR3B subunit was equipped with the NR1-like combination of asparagine and serine. The diheteromers investigated shed some light on crucial questions of the NR3B structure-function relationship, and the differences between this subunit and its closest relative, NR1. Previous studies on conventional NR1/NR2 N site mutants were successful in reporting assembly and function of the mutant subunits. This is not surprising, as neither the initial contact-forming domains, nor the dimerization interface lie within the depth of the pore . As expected, the finding that NR1 and NR2 N site mutant subunits can functionally assemble into NMDARs could be corroborated. 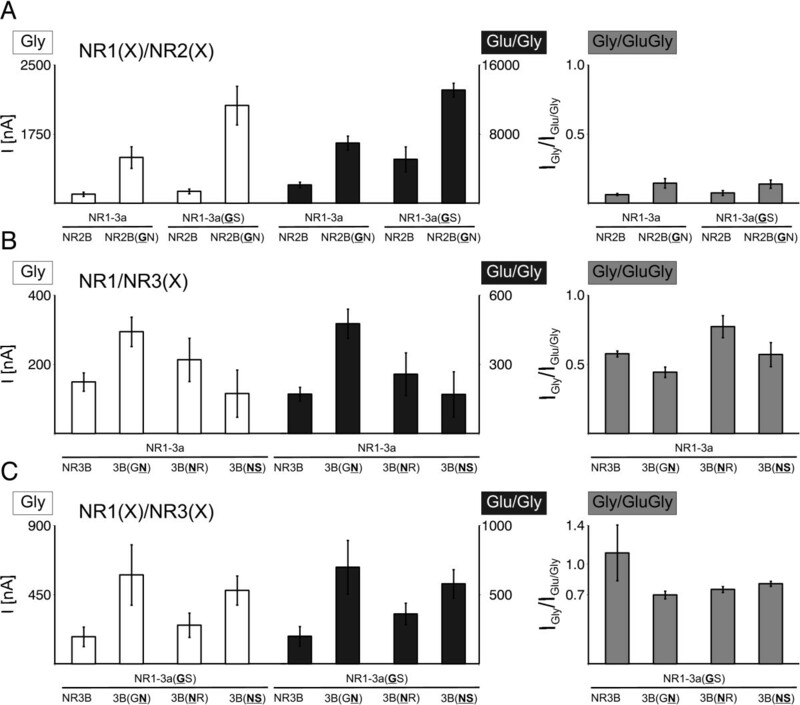 While affinities where not measured quantitatively, at least qualitatively the agonist profiles of conventional NR1/NR2 NMDARs and NR1/NR3 glycine receptors were not altered by introducing mutations: The conventional NMDARs required glutamate for full activation, while all NR1/NR3 diheteromers were fully activated by glycine. Slight potentiation of NR1/NR3 responses by additional glutamate can be attributed to the influence of endogenous XenNR2B, the presence of which could not be ruled out for all measurements [, and compare ]. For uncompromised investigations of the NR1/NR3 diheteromers' properties, it is therefore sensible to consider Mg2+ block and Ca2+ permeability measurements after the application of glycine only. While the agonist profile was generally unaltered, it is noteworthy that NR1/NR2B receptors gave rise to the lowest current responses. If either the NR1 or NR2 subunit was equipped with an NR3-like glycine at its N site, amplitudes were increased. This effect was increased if the NR1 subunit carried the mutation, and was strongest if both subunits were mutated - roughly approaching the sum of the effects of the single mutations. Considering the aforementioned study by Wollmuth and colleagues  on similar mutants of NR1 and NR2A, increased current amplitudes might simply be caused by widening the narrow constriction of the receptor pore: Enlarging the pore diameter thus effects a higher conductivity of the channel, an effect that was reported larger if the NR1 subunit carried the mutation, and additive if both subunits did . If this line of thought is followed, the observed increase in amplitudes might already hint at a lowered Ca2+ permeability and Mg2+ block, as coordination sites for divalent cations are lost in the widened pore. Current responses of NR1/NR3 diheteromers were similarly dependent on the N and N+1 site residues: The wild type glycine receptor again gave rise to the lowest current responses, but neither of the receptors featuring the NR3B(NR) or NR3B(NS) mutants differed much from the wild type in their current amplitudes. Replacing the bulky arginine at the NR3 N+1 position with the slightly smaller asparagine in NR3B(GN) might also increase the diameter of the permeation pathway by simple steric effects, explaining why the largest current responses were elicited from receptors with this mutant. The fact that in AMPARs an arginine at the Q/R site abolishes Ca2+ permeability, together with the notion that in a possibly widened NR1/NR3(GN) pore Ca2+ coordination might be disrupted, suggests that the N+1 arginine in NR3B is crucial for Ca2+ permeability. Ca2+ permeability - or the lack thereof - might well be the single most important functional property impacted by NR3. Ca2+ as a second messenger triggers a number of intracellular signaling cascades, among them those effecting the incorporation of new NMDARs into the membrane and supporting LTP. It is therefore crucial to understand how NR3 downregulates this most essential property of NMDARs. The arginine at the NR3 N+1 site would be a likely candidate for lowered Ca2+ permeability. Like the arginine in edited GluR2, this residue might effect electrostatic hindrance and the disruption of Ca2+ hopping relays. Equipping NR1 with an arginine at the N site reduces Ca2+ permeability . Here we show, however, that NR3B can be made Ca2+ permeable by exchanging one amino acid, but that is not the arginine at the N+1 site. In fact, the NR3B(GN) mutant is no more Ca2+ permeable than its wild type counterpart. Even the double mutant NR3B(NS), which carries both N and N+1 site residues of NR1, displays only a modest increase in Ca2+ permeability. But exchanging the NR3 N site glycine for asparagine yields a subunit that assembles into a glycine receptor more permeable for Ca2+ than NR1/NR3 wild types. In contrast, if the NR1 subunit carries an NR3-like glycine at its N position, Ca2+ permeability is non-existent, regardless of how the NR3 N site is equipped. This is also true if the mutant NR1(GS) subunit is coexpressed with NR2B: as a result of the glycine mutation, Ca2+ permeability is lowered. The same mutation in NR2 subunit has less of an effect. This suggests a cooperative effect: a glycine residue at the N site of either the NR1 or the NR3 subunit is sufficient to compromise Ca2+ permeability. NR3 naturally supplies this glycine, and thus downregulates NMDAR-mediated Ca2+ influx - as has already been shown for proposedly triheteromeric NMDARs [36, 37]. On the other hand, possibly due to the unique alignment of the NR1 and NR3 residues at the level of the pore , an arginine at the NR3 N+1 position does not impede permeability for Ca2+. While the diameter of the pore is crucial for ion permeation and Ca2+ coordination, pore size has been shown to be a minor determinant of how effectively Mg2+ blocks conventional NMDARs . Rather, the presence of Mg2+-coordinating residues is crucial for a full block of the receptor at negative membrane potentials. From the investigation of N site NR1 and NR2 mutants, it can be concluded that the full block by Mg2+ is compromised and significantly reduced if either one subunit in an NR1/NR2B receptor carries an NR3-like glycine at its N site. The block is reduced even further if both subunits are mutated; the mutations appear to be additive. Curiously, for currents elicited by the sole application of glycine, the combination of wild-typic NR1-3a/NR2B subunits appeared to be blockable by Mg2+ to an extent greater than 100%. To a lesser extent, this was also observed for NR1-3a/NR2B(GN) receptors. (Figure 4B). Obviously, if Mg2+ blocks more than the induced current, part of the block must stem from the inhibition of leak currents (LC). If the agonist-induced current (IC) is comparatively small, the ratio LC/IC becomes relatively large. On the other hand, if the induced current becomes large (as is the case for the coapplication of glutamate/glycine), the LC/IC ratio decreases. Given the experimental setup of the two-electrode voltage clamp method, a small LC/IC value would not cause a measurable change in block, whereas for a large LC/IC ratio, the contribution of the leak current (or block thereof) might be detected in recordings. In line with this, the wild-typic NR1-3a/NR2B receptors (where current block appeared to be more than 100%) gave the smallest current responses upon the sole application of glycine compared to the mutant NR1/NR2 subunit combinations. Further supporting this interpretation, for NR1/NR3 receptors, which are not or less sensitive to Mg2+ (depending on the mutants present), no such effect could be seen. It is noteworthy that the extent of Mg2+ block differs depending on the agonist applied. This finding strengthens the prevailing view of an unequal contribution of NR1 and NR2 to the Mg2+ block, but shifts emphasis to the NR1 N site residue. Equipping this closest relative of NR3 with an NR3-like glycine reduces the NMDARs sensitivity to Mg2+. As NR2B-containing receptors can be made (partially) insensitive to Mg2+ by either equipping them with an NR3-like N site residue, or by coexpressing them with a mutated NR1, it was not surprising that NR1/NR3 diheteromers could be made Mg2+ sensitive by the reverse mutation. Generally, when measuring the Mg2+ block of NR3-containing diheteromers, glycine-induced currents should be considered rather than glutamate/glycine-induced responses, which are usually influenced by endogenous XenNR2B and tend to display more "conventional" properties. But considering the glycine-evoked responses, it is obvious that if either NR3's N or N+1 site residue is mutated to asparagine, coordination of Mg2+ is possible to an extent that markedly blocks the receptor at -70 mV. The mechanism by which this is achieved, however, might differ for the two mutants. Generally, assembly of NR1 and NR3 might be critically different from that of NR1 and NR2, as shown by SCAM studies: It has been proposed that NR1 and NR3A assembly brings a ring of threonine residues in the outer channel verstibule into a planar alignment . As the TMD B of the NR3 subunit is rigid during gating, the threonine ring constitutes a constriction located externally of the conventional narrow constriction . According to this study, the NR3A N site is not involved in the selectivity filter of the NR1/NR3 diheteromer . If one adopts this finding for the NR3B subunit, it is obvious that the general view of an "inactive" NR3 N site has to be reconsidered in the light of the data presented here. With the combination of two rather large residues in the NR3B(NR) mutant, or the asparagine at the N+1 position in NR3B(GN), Mg2+ ions can be coordinated well enough to block the receptor, and more efficiently if the asparagine is located at the N+1 site. In summary, the picture forms of a cooperative Mg2+ coordination between (conventionally) NR1 and NR2, but also NR1 and NR3 (given the appropriate residue is supplied at the N+1 position). This also explains why the combination of only NR1-like N and N+1 amino acids in the NR1/NR3B(NS) diheteromer does not support an Mg2+ block. Consequently, equipping the NR1 subunits with a glycine at its N site should also abolish the block, which indeed is the case: There is no NR1 N site asparagine to interact with the residue at the N+1 position of the partner subunit; consequently, the prerequisites for Mg2+ coordination are not met. In summary, contrary to previous studies, the present experiments suggest that both the NR3 N and N+1 site residues are responsible for the (lack of) sensitivity to Mg2+ by interacting with the NR1 N site asparagine to coordinate the ions. In this study, we provide new insight into the structure-function relationship of NR3B, the least well characterized member of the NMDAR subfamily. While the importance of the N and N+1 site amino acids of NR1 and NR2 subunits for Mg2+ block and Ca2+ permeability have been thoroughly established, the equivalent residues in NR3 have been attributed little functional impact. The NR3B subunit supported both Ca2+ permeability and Mg2+ sensitivity when equipped with an NR1-like N site residue; conversely, both NR1 and NR2 subunits could be made Mg2+ insensitive and less Ca2+ permeable by replacing their N site amino acids with the NR3-like glycine. Thus, we provide evidence that the NR3 N and N+1 sites are critical determinants for the unique NR3-mediated functional traits of Mg2+ insensitivity and Ca2+ impermeability. We thank Jim Boulter (Brain Research Institute, UCLA, Los Angeles) and Michisuke Yuzaki (Keio University School of Medicine, Tokyo) for providing cDNA for NR2B and NR3B, respectively. NAC holds a personal fellowship from the International Graduate School of Neuroscience (Ruhr University, Bochum). We thank the Ruhr University Research School (Ruhr University, Bochum) for additional funding. NAC and GH generated mutant receptor subunits. NAC and AO carried out the electrophysiological measurements. NAC performed the statistical analyses, and drafted the manuscript. GS performed the MD simulations and participated in writing the manuscript. MH participated in the design and supervision of the study and writing of the manuscript. All authors read and approved the final manuscript.